No. 25A, Jalan Rajawali 2, Bandar Puchong Jaya, 47100 Puchong, Selangor, Malaysia. YES had a humble beginning in the year 1997. It started off as a small scale business in Georgetown, Penang dealing with shelving and racking. It was previously known as Yong Eng Seng Marketing. With major growth, YES today is a major local supplier of racking system in this region. Our extensive distribution and networking produce a wide customer range. YES group of companies expanded from marketing light duty shelving to warehousing projects, focusing in warehouse storage system. To be a reliable, responsible and cost effective warehouse storage solution provider for all our customers. YES aspires to maximize its products to reach to all, YES is an expert in consulting and advising customers, resulting in the best customized storage system with limited space. YES provides value added, cost effective and time saving services to create ultimate space.YES create an ideal storage system for personal, commercial, industrial and warehousing needs. YES is an established company with a strong Marketing. Research and Development team to meet our every need. 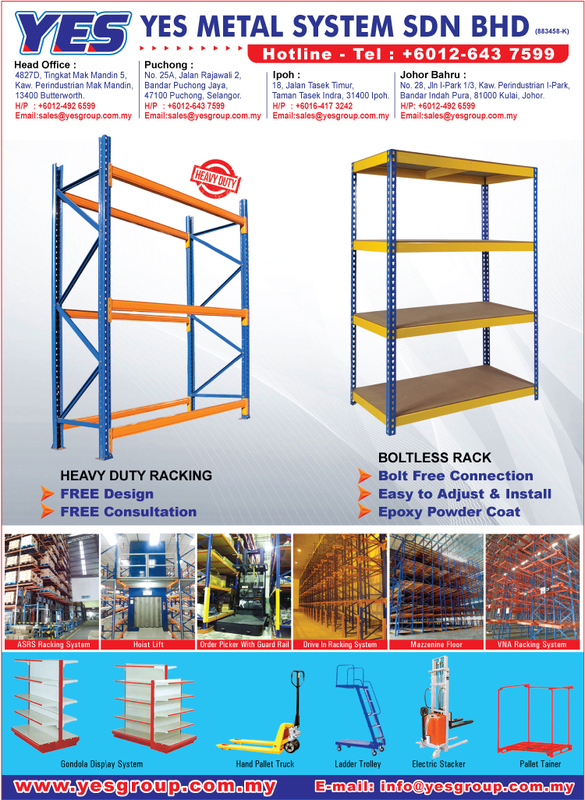 Over 10 years of proven track records in product development, sales and marketing, we are now proud to be one of the Malaysia's largest total storage solutions providers and racking components manufacturer of storage. With the extreme and positive grow of YES group; the company has been incorporated as YES Storage System (M) Sdn Bhd in 2000. Our operations are mainly based in Mak Mandin, Butterworth. Today, we have our showrooms not only in Penang Island meanwhile also available at Prai, Ipoh and Alor Setar. On the other hand, we have our subsidiary, YES Storage System (KL) Sdn Bhd located in Puchong, Selangor. Showrooms and subsidiary setup are to meet rapid growing of customer demands. Nowadays, we have diversified our business to some few related range of industries, like Product Display System, Material Handling Equipments and Metal Fabrication work. Therefore we are the one stop total solution providers for display system. With a focus on quality, innovation and flexibility we are committed to meet the highest customer expectations at all times. We are confident that we provide quality products, value added services, after sales services and good public relationship with our customers and vendors.